In the world of championship boxing, the arenas which host the bouts quite often become nearly as famous as the warriors which graced their canvas stages. Those which come to mind are legendary venues such as Madison Square Garden in New York City, Cobo Arena in Detroit, the Blue Horizon in Philadelphia, and more recently, the Las Vegas sites such as Caesar’s Palace, the MGM Grand, and Mandalay Bay. For boxing fans in Southern California, though, one name stands out when it comes to the sweet science: the Olympic Auditorium in Los Angeles. 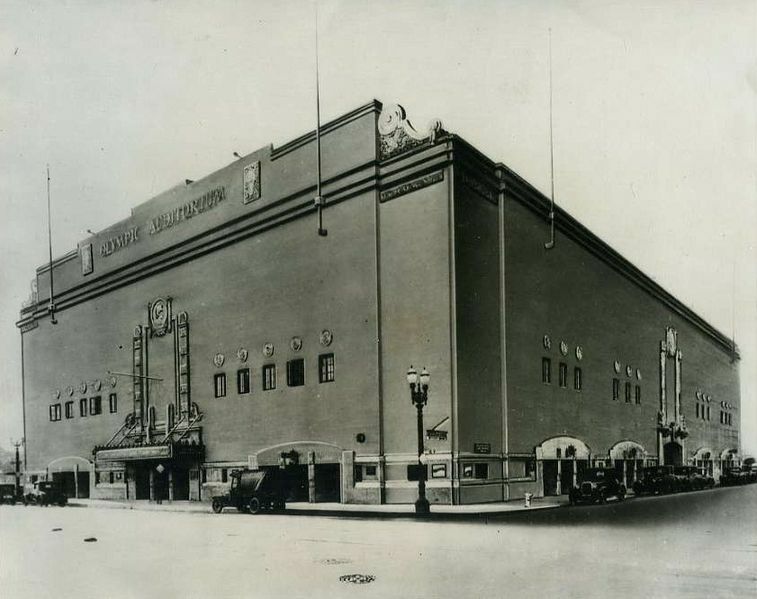 The edifice was constructed in 1924 in preparation for the upcoming Olympic Games of 1932 (the location at 1801 South Grand Avenue led to its later name of the Grand Olympic Auditorium). At the opening ceremonies on August 25, 1925, celebrities such as screen legend Rudolph Valentino and boxing champion Jack Dempsey were in attendance. Dempsey had also turned over a spade of soil at the official ground breaking ceremony prior to construction. Back in the day, the Olympic seated 15,300 people (later reduced to 10,400 seats), the largest boxing specific venue in the country at that time. It sported 17 rows of ring-side seats, and a large, steep balcony which provided more places for fans. At the 1932 Games, boxing, weight lifting, and Greco Roman wrestling were the featured sports at this site. But this, of course, was just the beginning. Over the next several decades, the Olympic featured some of the greatest names in the fight game as Tuesday, and later, Thursday night cards entertained Los Angeles area boxing fans. When the city’s other famous venue, The Hollywood Legion Stadium with its Saturday night fights, closed its doors in 1959, the Olympic seized the opportunity and began a long series of Friday and then Saturday night cards that lasted until 1980. Some of the greats of the “squared circle” who plied their trade at this famous arena in the early days were Bert Colima, Speedy Dado, Baby Arizmendi, and the great Henry Armstrong. Arizmendi and Armstrong had five classic encounters, the last two at the Olympic. Other big names who later came through its tunnels were Ken Norton, Joe Frazier, George “Scrap Iron” Johnson, Irish Jerry Quarry (from nearby Bellflower), Mando Muniz, Bobby Chacon, Oscar “Shotgun” Albarado, Carlos Palomino, Ernie and Danny Lopez, Rodolfo Gonzalez, Hedgemon Lewis, Enrique Bolanos, Art Aragon, Manuel Ortiz , and, more recently, East L.A.’s Oscar De La Hoya. One of the arena’s most legendary bouts was on August 6, 1970 when former World Lightweight Champion, Mando Ramos, faced the tough Cuban, Ultiminio “Sugar” Ramos, the former World Featherweight title-holder. Though cut over both eyes and bleeding severely, Mando edged Sugar in a split-decision. I admit that I don’t know a whole lot about boxing, but I do recognize when something is written well. I think this is a great article! Very well written and very informative. Looking forward to the Part II. Bernie had a brief career in 1964-1965 … ring record 9 wins, 8 losses, 1 draw with 5 knockouts … fought as a welterweight (147 lbs.) mostly at Olympic Auditorium in Los Angeles with fights in Las Vegas & also had a fight in Santa Monica … not sure where he is today? My father Elias “Licho” Guerrero fought Rodolfo “El Gato” Gonsalez there at the Coliseum back in the 60’s and also won against aponents like Boots Monroe.. He still lives and tells me all about his good memories.